Bar manager for 14 years at the Bear Republic brew pub in Healdsburg California, Ryan Lindecker has already had a good day. “I already went fishing” he cracked as he poured another pint of Racer X for the enthusiastic and grateful patrons at the bar. But I got the impression that for Ryan, just about every day is a good day for him. Ryan has been there since just about the beginning of Bear, and is happy to point that out as well as the fact that he is a descendent of the man that invented the automated hop picking machine. He loves his beer history, and he loves Bear Republic and it shows. 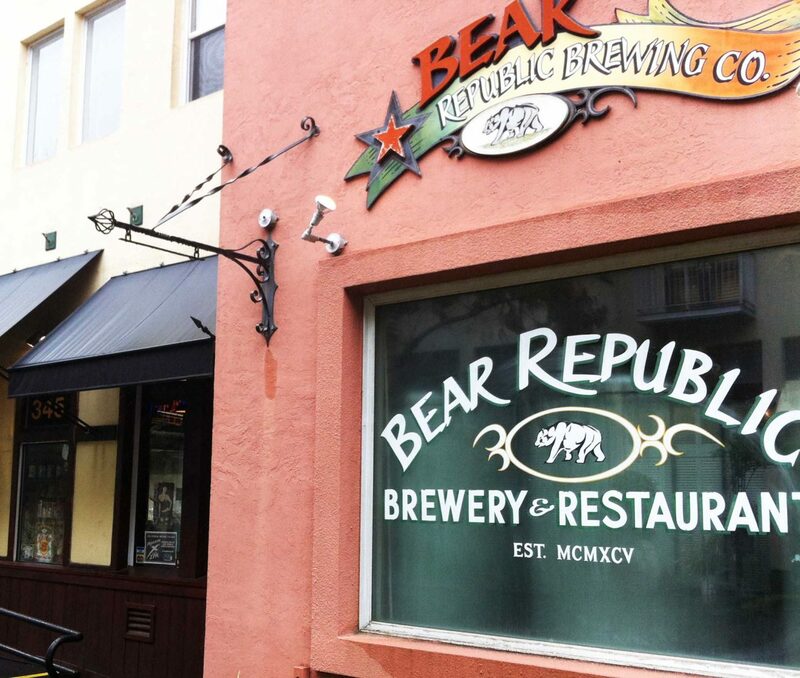 I had the pleasure of spending the afternoon about two hours north of San Francisco in Sonoma county at the expansive Bear Republic brewpub, sampling great beer, meeting cool people and talking about the success of Bear Republic Brewing. 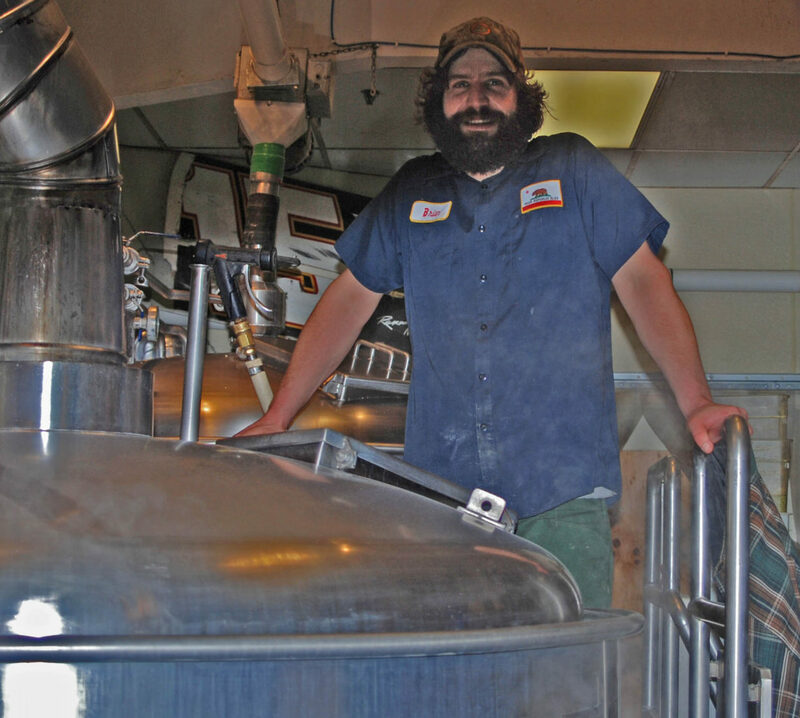 I started by chatting with Brian the brew master of the brewpub, who was standing over the steaming brew kettle, working on a batch of “new” pale ale – which he said was very different from the popular XP. Brian has been there about 5 years, and reveled in the success of BR and being able to grow along with the company. “We make more beer, so we make more money, so we can buy more tanks, so we can make more beer, so we can buy more tanks…” So it goes for Bear who opened a separate higher capacity brewing facility in near by Cloverdale within the last couple of years. 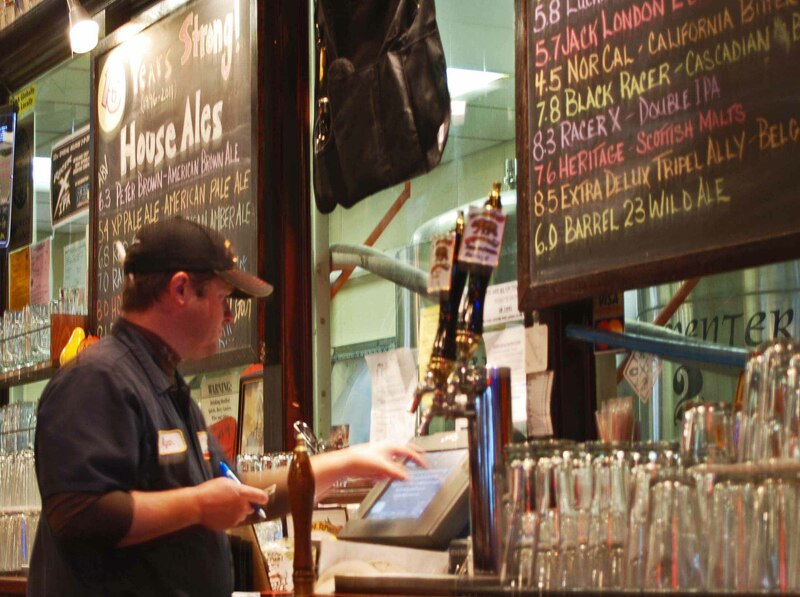 I started out with a pint of the classic “Racer 5” IPA – which I first had at a Yards Bar in San Diego in 2006. It was a refreshingly bitter citrusy punch in the mouth of aromatic hops then and still is now. Ryan explained that he remembered pulling the first pint of Racer 5 in 1996 and how it blew him away with flavor. 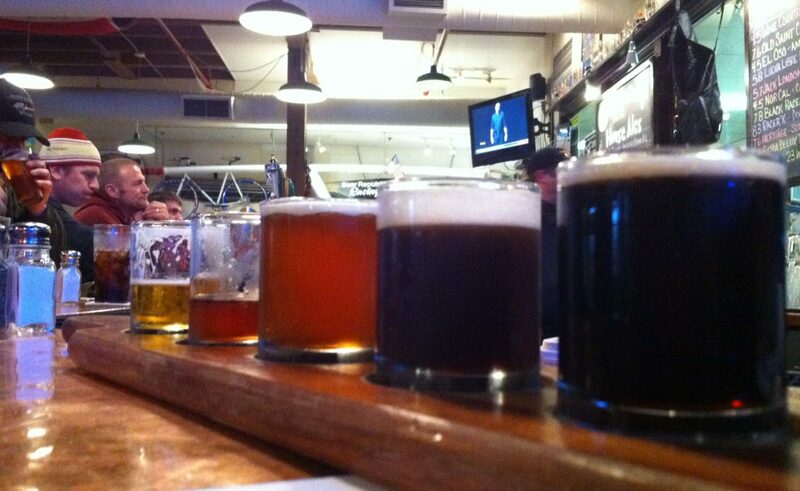 Back then when they brewed every 50th batch they added extra hops – so they called it Racer 5. (The “Racer” part of the name – he chuckled – is cause Racers are cool, one of the brewmasters actively races cars – “factory Cobras”). I had to try so many of the pub specialty brews that I went for a taster flight of six – following the lead of a regular patron sitting to my right – who was crazy for the Belgian Triple, but just couldn’t decide which beer to refill his growler (“my girlfriend will kill me when I bring this beer home too”). My “pick six” selected by Ryan included: “Deluxe Triple Alley” 8.5 ABV, “Barrel 23” Wild Sour 6.0%, “NorCal” California Bitter 4.5%, “Old Saint Chango” a winter warmer at 7.6 ABV, “Black Racer” – cascadian black IPA 7.8% and “Heritage” a turn on the Scottish Ale style also at 7.6%. They were all great from start to finish, and the Triple and Wild Sour were a change of pace from the California hoppiness – as if I needed a break! I found the Chango a great flavor combination of mexican chocolate, hops and maltiness. That was my growler decision, grateful that I had a room with a fridge to take it back to.